Unconventional climate science predicted harsh winters in N. Hemisphere. Expert Judah Cohen explains how this happens in a warming world. Then: the super warming gas methane only lasts 10 years. But it drives centuries of sea level rise, says Dr. Kristen Zickfelt. We need to control methane – and that’s not what the frackers and pipeline operators want to hear. There will be no moaning about American politics in this program. The word shmump will not be heard. But wait, don’t go away! We will find out why this winter in the Northern Hemisphere has been so cold in so many places, despite global warming. If you have been shivering, you’ll want to hear this. We have a top expert who predicts the secrets of winters for governments, corporations and the military. Then we’ll get more new science with the stunning news that greenhouse gases like methane can keep the sea rising for centuries, even though the gas itself disappears from the atmosphere in ten or twelve years. I’m Alex Smith. This is Radio Ecoshock. Prepare for more world wonders explained. Lately the cold and snow has been hard on Istanbul Turkey, and terrible for Bulgaria and the Ukraine. In Moscow, the Orthodox holiday was the coldest Christmas night in 120 years. I don’t have to tell people in the U.S. Midwest and Northeast – or Canada – about driving Arctic cold and extra snow. Maybe you’ve heard of the Arctic Vortex. That’s part of it, and we’ll cover that. But there’s something else, a condition that helps weather specialists predict the kind of winter coming. To help us understand, I’ve reached Dr. Judah Cohen. He’s worked at the NASA Goddard Institute for Space Studies, when James Hansen was the Director. 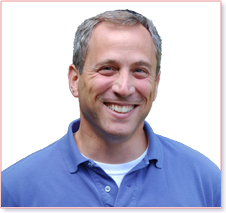 Cohen has been a research scientist at MIT’s Parsons Laboratory. Since 1998, he’s continued to publish scientific papers, while employed by the weather consulting company Atmospheric and Environmental Research. Governments, the military and private industry are helped by his work, teasing climate science into the near-future. We talk about the extraordinary weather this year. Of course the “Arctic Vortex” comes up. When TV weather people started using that term to explain severe winter storms hitting the Northeastern United States, Cohen and other climate scientists were horrified. That’s because the Arctic Vortex really refers to a current of air movement in the stratosphere, perhaps 10 miles up. It didn’t really refer to the weather we get lower down, called the Troposphere. However, the stratospheric movement of winds that used to keep the Arctic weather in the Arctic, has been changing. So Cohen came to accept the public understanding of the Arctic Vortex. We talk about the group of scientists, including Jennifer Francis of Rutgers (a guest on Radio Ecoshock) who say the warming Arctic has derailed the Jet Stream, making large waves that are slower moving, and bend further north to south. That means weather can “stall” over a region for longer (which can mean torrential rain or snow if the conditions are right). Plus, very cold air from the Arctic can penetrate further south – even as some warmer air from the tropics can move further north, on the other side of that wave. 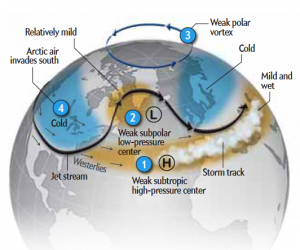 We also talk about another force, the “Arctic Oscillation”. According to Wikipedia, the Arctic Oscillation is an index which “which varies over time with no particular periodicity”. It is possible to predict how or when this swing in weather will come? That is where the work of Judah Cohen particularly stands out. It seems fair to say the “mainstream” of science says the Arctic Oscillation is random, and cannot be predicted. But Cohen has studied it. He finds that the amount of snow accumulating in Russian Siberia in the month of October can be connected to the type of winter that hits the whole northern hemisphere later. If there’s a lot of snow in Siberia in the fall, look out. And this is happening more, now that the Arctic sea above Siberia is hotter and more open. That’s the side of the Polar Sea which opens up first, and stay open longer these days. The ice stays longer on the Canadian side. Cohen is one of the few climate scientists brave enough to put his predictions to the test. He has to. Judah Cohen works for a very influential risk analysis group Atmospheric and Environmental Research. It turns out investors, energy planners, military leaders and politicians (right down to big city Mayors) want to know what winter conditions are coming. They may stock more oil, or salt, or buy into energy stocks, if a cold winter is expected. So far Cohen’s system is predicting well, better than most, but not perfectly. Judah tells us there is a meeting of scientists this February to discuss how the Arctic warming is affecting the world. I learned a lot from this interview. You will too. Judah Cohen is a hybrid mix. Too many meteorologists don’t take advantage of climate change science; and most climate scientists won’t talk about the coming winter at all. They prefer to work in decades at least. Here we have a long-time scientist bridging those worlds. Strong and cold winter storms in certain parts of the world, including a U.S. media center like New York, is so counter-intuitive. It’s the opposite of the warming winters we had for a few years, the opposite of what we expect. We thought winter was over. How are we ever going to tell billions of humans “if you experience a harsher winter it’s because the world is warming”? That’s part of the them of this article “The Polar Vortex Is Back, and a Warmer Arctic May Be to Blame“. Find Judah’s web site here. All Judah Cohen’s recent papers are listed here. Here is an interesting article about winter prediction, with Judah Cohen, from Mashable. We humans release greenhouse gases beyond carbon dioxide. We don’t hear as much about them, because they don’t last as long in the atmosphere. But now we learn these gases can cause sea levels to rise for centuries. That comes in a new paper led by Kirsten Zickfeld, one of the bright young women scientists rising up in the climate field. Trained in Germany, Kirsten is an Associate Professor of Geography, at Canada’s Simon Fraser University. One of her co-authors is Susan Solomon, the famous atmospheric chemist from MIT. The new science was published December 2016 in one of the world’s top journals, the Proceedings of the National Academy of Sciences, or PNAS. The paper is: “Centuries of thermal sea-level rise due to anthropogenic emissions of short-lived greenhouse gases“. One of our themes in this interview is a question Kirsten has worked on for years. She’s published several papers which look at this key question: is climate change reversible? 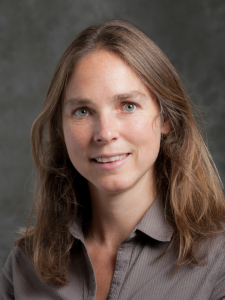 As we discuss in the interview, a 2013 paper titled “The Reversibility of Sea Level Rise” led by the UK scientist Nathaelle Bouttes was one of the few examining a different relationship for sea level rise. Suppose we do geoengineering, to cool the Earth by shading the Sun, or fertilizing plankton to grab more CO2. Maybe a technology to capture and store CO2 starts to work. If we get temporarily cooler, or reduce CO2 in the atmosphere, can we go back to the climate state humans have always known? If appears the answer is “no”. For one thing, as this new paper show, sea level rise will continue anyway. That’s because of the long (centuries at least) thermal delay built into the oceans. Some of the warming, maybe most of the warming we’ve already created has been absorbed and buried in the seas. That will come out again – later. So it’s possible the world could continue to warm, despite a lower CO2, or solar radiation management. Hopefully though, we might not reach catastrophic levels of change. That seems to be the best we have. We discuss another set of lesser-known greenhouse gases. These are chlorofluorocarbons, better known as CFC’s, and their replacement chemicals. One of the co-authors of this paper is Susan Solomon of MIT, a world renowned specialist in atmospheric chemistry and climate science. She’s published extensively on the ozone hole. So this team was in a good place to ask the question about shorter-term gases: supposed CFC’s were not banned by the Montreal convention of 1987. What amount of sea level rise would they have added by 2050? The paper suggests the seas would be about 14 centimeters higher in 2050, simply due to CFC’s. Unfortunately, although they are better for the ozone layer, the replacements for CFC’s are also very powerful greenhouse gases. Environmental groups like Greenpeace warned about that decades ago. Now scientists are saying we have to replace the replacements. There are better chemicals available. We’ll have to do it. I was struck by this case study partly because the fossil fuel industry and their politicians continue to push a very gradual phase-out of coal, oil, and gas. That’s despite a recent study showing the carbon budget to keep us under the 1.5 degree danger line will be spent, sometime in 2018. See here and here. Maybe we use this case study on ban versus phase-out, in the case of fossil fuels. That is related to an earlier paper where Kirsten Zickfeld was the lead author. Published in 2015 in the journal Environmental Research Letters, the title is “The time lag between a carbon dioxide emission and maximum warming increases with the size of the emission“. That opens up another huge debate in climate science. I won’t go into it here, but we do go there in the interview. The paper by Zickfeld, Solomon and Gilford ties into a long-running debate in the climate science community. In September 29th, 2004, in the dark days of the oil-men Bush and Cheney in the White house, a muzzled Dr. James Hansen of NASA suggested dangerous climate interference could be averted by controlling methane. At the time, I though “well what else can he say?” – but now that paper by Hansen and Makiko Sato looks more important. I covered that whole story in my show for October 25, 2006, with a blog titled “The Methane Fix”. Since then, we’ve had David Archer, a leading climate scientist from the University of Chicago, on Radio Ecoshock telling us worrying about methane is a distraction from the real deal: carbon dioxide. We KNOW carbon dioxide will wreck the planet, while possible increases in methane from the Arctic are still in the future. With this broadcast, we come back full circle, with Kirsten Zickfeld saying the long-lived sea level rise from short-term gases like methane mean we absolutely must control emissions of both CO2 AND the shorter-lived gases like methane. I didn’t get an exact figure from Kirsten about the global warming potential of methane that her team used. There is more new research about that, this time published in Geophysical Research Letters on December 27, 2016. That’s an open access paper titled “Radiative forcing of carbon dioxide, methane, and nitrous oxide: A significant revision of the methane radiative forcing” with lead author Maryam Etminan at the University of Reading. They find the warming from methane from 1750 to 2011 is about 25% higher than the number used by the Intergovernmental Panel on Climate Change 2013 Assessment. You know methane only lasts up to 12 years in the atmosphere, before it breaks down into CO2. But even if we stretch it’s total warming contribution to 100 years, to compare it with carbon dioxide, this new science finds that impact is 14% higher than the IPCC thought. That’s a very big change, with methane looking meaner than ever. As you heard, Zickfeld’s new work only looked at rising seas due to ocean heating, so-called thermal sea level rise. The authors didn’t try to take in the nasty feed-back loop from melting permafrost. But even there, another new paper, published in the AGU’s Geophysical Research Letters on December 29, 2016, urges caution. The authors led by Brett Thornton found it tricky to estimate methane coming from the many new ponds forming in the tundra, among the wetlands. Improper counting can lead to unintentional double-counting of methane, they warn. That would explain why attempts to calculate methane emissions based on ground maps arrived at much larger figures than actual methane measured in the air. It’s all a work in progress, meaning we know methane will increase, but we don’t yet know by how much. Meanwhile, industrial sources of significant methane, whether it’s the fracking industry or gas pipeline operators, tend to wish away the impacts by saying methane is short-lived and not consequential. This new paper led by Kirsten Zickfeld definitely challenges that claim. And speaking of great experiments humans create in nature, I hope you noticed the warning from Kirsten Zickfeld that while we don’t know the whole impact of adding so much extra greenhouse gas to the atmosphere. We also don’t know the impact of taking them back out again, if we ever manage to do that. Nothing really ever goes back in Nature. In living ecosystems, life moves on to new forms. Unlike Dorothy in the Wizard of Oz, we never really get to go back to Kansas. All we can do is struggle not to unwittingly push ourselves and our plant and animal friends off the planet. I’m Alex Smith. Thank you for listening to Radio Ecoshock, and caring about our world. Thanks for years of excellent work. Please research the Grand Solar Minima/Maxima, and the impact solar magnetic fields on tropical depressions and lithospheric pressures (whew!). It is all connected, and pollution, deforestation and people unwilling to use appropriate technologies builds in disappointments(a box house in the winter or hurricane wind). If we plan on being around in a few hundred years we should live like that now.